The North Star Historic Conservancy presents a staged reading of Sands Hall’s FAIR USE, which explores the controversy surrounding Wallace Stegner’s use of the life and writing of Mary Hallock Foote in the creation of his novel, ANGLE OF REPOSE. 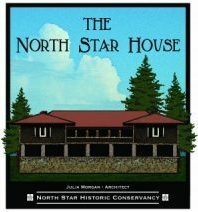 This performance is dedicated to the memory of Peggy Levine and her passion for The North Star House—for its famous architect as well as its famous residents—and who had so much to do with it’s restoration, and with making it the terrific community event venue it is. Featuring Lois Ewing, Kim Culbertson, Les Solomon, Thomas Taylor, Sharon Winegar, and T.E. Wolff. Directed by Sands Hall. Doors open at 2:00 for mingling and tours (snacks provided; beverages available for purchase); performance begins at 2:45. The performance will take place in the courtyard. Tickets also available at SPD Markets and the Book Seller.